There are many types of metal and each requires different metal cutting techniques. Because of this, there are a variety of methods available to cut metal materials. The method you choose for your project will depend on the type of metal being used, the level of precision that is required and the intended use of the fabricated part and project. For smaller cutting jobs, hand tools, including hand shears and hacksaws may be used for cutting metal into the desired shape. This cutting method is best suited for projects using more pliable metals, such as thinner-gauge aluminum. Using hand tools to cut metal is not recommended if the metal must be cut into extremely small pieces because the force needed to cut the metal may simply break it, instead of cutting it as intended. Chisels can also be used to remove excess metal and to make a shape more precise. Depending upon the job, you may opt to use a cold chisel, with a sharpened edge or a hot chisel, which is heated before being hammered through metal. For larger projects or those that use thicker or more robust metals, manual cutting is not always practical. There are numerous machine-based cutting methods to choose from, based on your metal cutting needs. Grinder – For projects that require the finished part to be extremely smooth, a grinding machine may be your tool of choice. 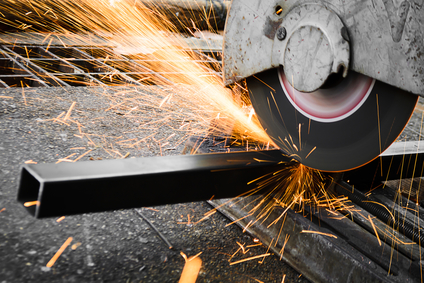 Using a rotating blade or wheel made of an abrasive material; a grinder uses friction to wear down the surface of the metal until it is smooth, similar to sanding wood. Lathe – Using a sharpened cutting tool against a rapidly spinning piece of material, a lathe will cut a piece of metal to its desired shape. This machine is very common in the machining industry because it allows for a higher degree of precision. Punch – This machine uses an extreme amount of pressure to force sharpened blades into or through metal to cut it into the shape desired. The amount of pressure generated by a machine punch is far greater than any human worker could produce, thus this cutting method is suitable for metals that are more robust. Some machine punches are capable of up to 1,000 hits per minute, making this cutting method very productive. Water jet – Using water or water mixed with an abrasive compound, this machine directs an intense and concentrated stream into metal and cuts it. This method is best suited for metals that may be sensitive to extreme heat or temperature changes because it does not use heat in the process. Flame and plasma – This process is similar to a water jet, but instead a flammable gas is pumped through a torch to create an intense hot flame. The flame then cuts the metal by burning and melting it. Flame torches, such as oxyacetylene torches are very efficient for cutting. Plasma cutters are known for their high degree of precision because they burn much hotter. Laser cutting is one of the newest and most exciting methods in cutting technology. These cutters apply an intense beam of light to the metal, heating it past its melting point, and then cut through the metal. A laser cutter is able to concentrate light onto a very small area, which makes this method suitable for projects that require a very high degree of precision. However, this method is slower and more expensive than other methods of metal cutting. I especially appreciated the information ,Really very useful ! All metal cutting method explained well.